Have you noticed that it’s always the little things that cause us the most irritation? Or is it just me? I am fantastic in a crisis. I keep my cool and think on my feet. I can take the bigger blows of life quite philosophically too. But then I will get all flustered and bothered about some silly thing that might happen. Jose might say something that I misinterpret and I’ll get all worked up. Or I’ll get all irritated about the house being in a mess or things out of place. Or someone will pass a remark and I’ll take offence – even if I really don’t care for that person’s opinion. I haven’t read Richard Carlon’s ‘Don’t Sweat the Small Stuff’ but it seems like a good mantra for me to adopt! I have begun to realize that it’s the little things that irritate that point out something. I remember reading about Carl Jung’s theory of the shadow projection where he said: we still attribute to the other fellow all the evil and inferior qualities that we do not like to recognize in ourselves. When I find someone’s behavior irritating is it because that behavior subconsciously reminds me of my own? Every little ‘rub’ is a call for me to look deeper within. They are actually an invitation for me to work on my inner self. What in your life is a call to ‘polish the mirror’? This post to me is very similar to the idea that Jesus talks about where we should not point out the splinter in someone else’s eye until we have removed the boulder in our own. 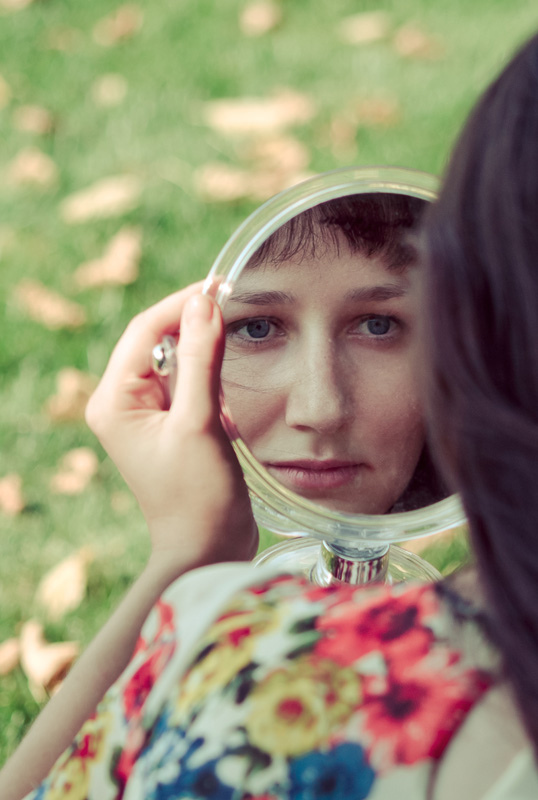 In the same way, those things that most bother us about someone else SHOULD cause us to look in the mirror because it may very well be the very thing that we most need to work on ourselves. Great post Corinne! It’s the little things that make us happy and the little things that drive us crazy! I think there is something true about your theory. At those moments when we get irritated, we all would do well to look at ourselves to see if it is warranted. Yes, I’ve hear of the shadow projection many times before…and I guess it’s true in a sense. Or perhaps, I just need to clear out some things in myself inorder to be more objective than emotional. Thanks, Rachel. We really should. Corrine, what timing that I read this today! This weekend the little things became very heavy, so we talked it out and are making a renewed start today – gotta work to not let the little ones become the big ones! Corinne, I made it! I’m not the most techno savvy soul so thanks for your patience. Anyway, as I said, this post really hit me. I’ve been a bit anxious and irritable lately, snapping at my husband for minor things, and allowing small things to overwhelm me. I hate when I let this happen. It’s a sure sign that I’m a bit off balance and I need to center on the truth—that being, that I am not in control, everything will be fine, and if I don’t accept myself as I am I will never be able to accept others. So…I’m going off to center and hopefully embrace myself and all that life is presenting to me today. Thank you for always telling the truth and not trying to pretty things up. It is what it is. Thank you for your patience and for sharing, Leah. Yes, it’s important for us to get our balance and sense of proportion right. What you said is so true, if I can’t like myself, how can accept others. You inspire me, Leah. Thank you. You must read Richard Carlson’s Don’t Sweat the Small Stuff! It’s a fantastic book that helped me through several difficult times. I am like you about the big stuff and the small stuff. I have to let go and remind myself that a year from now most of the stuff I’m worried about won’t even matter! I must get the book, Betsy. I like what you said that in hindsight all this will look so petty – enough to get me to stop acting nuts! Thanks, Betsy. I don’t get that much irritated after I have my monthly period. But when I’m PMSing, I’m a totally different person. And I can get really annoyed by the slightest mistakes. I hate it when that happens. And I don’t want to blame it forever on hormones because I know there is something I could do about it. PMS can do that to us, Irene. However, when I’m aware of it – I’m able to control myself better. Boy, oh boy, did I need to read this entry! Thank you for it! It takes a lot to get to me, but once gotten, oh boy! Jung is one of my favorites. Housework is an ongoing process – lots of deep breaths! It was meant for us all, Nikky. Very true and thought provoking. Great post! Love it! Looking at the (wo)man in the mirror takes courage…like Michael Jackson sang, “If you want to make the world a better place, take a look at yourself and make a change…” THanks, Corinne. That was one of his better songs, Jimi Ann. Thank you. I think I have grown up now .. and I jsut do the best ignore it all.. I think I have loads of growing up to do then, Bikram. Thanks so much, Jennifer. Your girlfriend sure is funny. I’m going to remember for a long time. Don’t feel bad. I can easily be irritated all day long. But give me a cup of coffee and I’m a happy little soul. Well, let me say that it isn’t always our own weaknesses or failings that annoy us in others, but it surely can be some times. I find I am most introspective when something has annoyed me beyond reason. Meaning out of proportion to the actual ‘thing’ or what was actually said. That is when I think it is my reflection annoying me. My largest irritation, though, is people who cannot tell the truth and that is most definitely not me. I tell the truth and I want to hear the truth. Period. Thank you, Jo. Yes, I understand what you say – if our anger is out of proportion it should be read flag. Like you, the little things trip me up. In a crisis, I am very calm and do what needs to be done. But losing my car keys the other day had me unglued! Love the Rumi quote. I would feel blessed right now if I had small irritants in my life. Seems like I have one big issue or another always. I don’t get irritated at the small stuff anymore because I have relaxed and realized what matters in the end is how I lived not how others thought I lived. This is such a true post though, I have to polish my mirror quite a bit, but I work hard at not reacting out loud or with moods to the small stuff. Thank you. I know what you are dealing with Jan and you’re doing so with amazing grace and love! Very true…great post! I am reading a book right now by Ken Wilber that talks a lot about Jung’s concept of the shadow and how it’s important to identify and understand our shadows and make peace with them so that we can grow and find peace. Thanks, Jessica. The book sounds interesting. I must look it up. I agree with Janaki when she says we ‘mirror each other’. It’s always amazing to me that when I think someone is doing ‘fill in the blank’ to me, they think that’s exactly what I’m doing to them! We each have an opportunity to polish the mirror, or not, if we choose to look at it that way instead of blaming each other. What in my life is a call to polish the mirror? Every freakin thing!!! Nice quote, Linda. You’re so right – everything is a call to look within! Thanks for sharing. That’s another way of looking at it, Mary. But often our releasing of steam can cause a lot of hurt to someone else. We mirror each other, I think. I can handle the big stuff when I get irritated with the smaller ones and am always at logger heads with my kids. I am trying to change, but that doesn’t happen too easily. I feel bad when unjustly accused of something but then the other person must be justified in doing what he did and I thought otherwise. It happens, we do get worked up over some issues in life, we are human 🙂 Lovely post. Thanks, Sulekha. You’re so right. We have to put ourselves in the other person’s shoes too. Not always easy, I’m afraid. I’m learning to let the irritants teach me about myself, Joyce. I am someone who tries to just let the small stuff roll off but it is normal to become irritated or annoyed but what matters most is how we handle it. Yes, irritation is natural but how we act on it shows what’s inside, RoseAnn. This is so true. I’m the same way and I think s spend a lot of energy just being mad at myself for getting mad at the little things in the first place. I like that phrase: polish your mirror. Thanks for sharing, Sili. Yes, I’m polishing away. I use to be irritate by every little thing.. the way I saw or solved issues, comments and behaviors..till I realized that I was attaching my emotions and perception on those experiences…Learning to separate emotionally and being objective about that particular trait or experience..was tough and the funny thing is that it does not get easier .. it gets more complexed! This is absolutely true, Corinne. So many little things that bother us do point to something lacking in ourselves about which we need think and reflect upon in order to keep our mirrors polished. It is in examining those irritants in our lives that help us to grow and change. Thank you, Martha. It’s easier to write about than to do the work, I’m afraid! But I’ll get there!